Tonight is the night. Tonight is the night when death begins to cross the threshold into life, when Jesus begins to slip away from the disciples and from his life here on earth and surrenders to what will be, surrenders to where this journey will take him. But before all that, before the history of the world changes, before the Divine comes once again flooding into the earth, before Jesus takes that last walk to the Cross, he gets up and ties a towel around him, kneels, and washes the disciples’ feet. Think about what an intimate act that is in the middle of this Passover crowd. 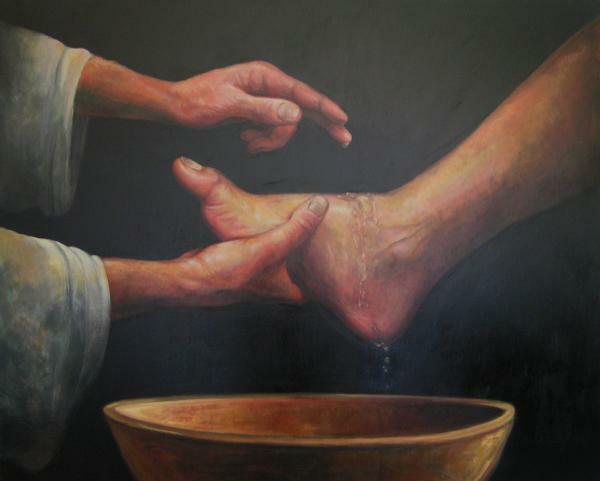 The first time I participated in a foot washing, I have to admit I was a little reticent at first. Wouldn’t this be uncomfortable? After all, washing feet is very intimate. Yep! That would be the point! I remember washing one woman’s feet. Her name was Caroline. When I picked up her feet, feet that had had a hard life early on in her native Nigeria, feet that had seen wars and conflicts, feet that had known deep grief in the death of her husband when she was a young woman and deep joy at the lives of her four sons who she had raised alone, I felt life. It was palpable, almost scary, as if it shot through me. 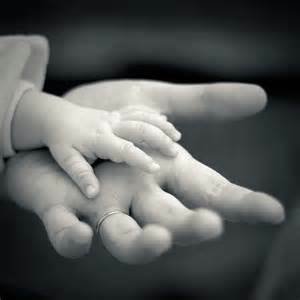 There, holding in my hand, was not a foot, but life, God-given life, rich life. I was holding her humanity—and mine. And then Caroline started praying aloud in her native language. It was incredible. It was transcendent. I understood what it all meant. I understood why Jesus knelt and washed the disciples’ feet. Washing feet calls one to serve; having one’s feet washed calls one to be vulnerable, to let go, to surrender. Foot-washing is life. It is a way of entering each other, of knowing each other, of sharing each other. If you know these things you are blessed if you do them. When Jesus was finished, he got up, removed the towel, and looked at the disciples. He had tears in his eyes. He knew this would be the last time that he would share in this way with them. This would, after all, be the last night that Jesus could share humanity with them. He knew that and now they did too. Sharing humanity…such a rich, profound, joyous, sometimes painful experience. Jesus showed us what being fully human looks like—not “only” human, but “fully” human, the way God created us to be. Being fully human means compassion; it means service; it means vulnerability; it means connection; it means love; it means life. It would be impossible to maintain the barriers we build between us if we were fully human. Oh, don’t get me wrong, I don’t think being fully human means that we sit around with permanent smiles on our faces and sing “Kum-ba-yah” nonstop. (Nothing against that song.) Being human means that you feel—feel joy, sorrow, hurt, anger, etc. So being fully human means that you feel them fully, right? You feel them and then you take your shoes off and wash each other’s feet so that they can feel them too. Wow! Let’s have Congress wash each other’s feet. Not only would that stay a few news cycles, it might even get them to talk or even listen. Let’s have all of the leaders from every country meet for a day of old-fashioned footwashing. I wonder what the world would look like if we shared our humanity. FOR TODAY: First, take your shoes off. And be fully human. 21After saying this Jesus was troubled in spirit, and declared, “Very truly, I tell you, one of you will betray me.” 22The disciples looked at one another, uncertain of whom he was speaking. 23One of his disciples—the one whom Jesus loved—was reclining next to him; 24Simon Peter therefore motioned to him to ask Jesus of whom he was speaking. 25So while reclining next to Jesus, he asked him, “Lord, who is it?” 26Jesus answered, “It is the one to whom I give this piece of bread when I have dipped it in the dish.” So when he had dipped the piece of bread, he gave it to Judas son of Simon Iscariot. 27After he received the piece of bread, Satan entered into him. Jesus said to him, “Do quickly what you are going to do.” 28Now no one at the table knew why he said this to him. 29Some thought that, because Judas had the common purse, Jesus was telling him, “Buy what we need for the festival”; or, that he should give something to the poor. 30So, after receiving the piece of bread, he immediately went out. And it was night. 31When he had gone out, Jesus said, “Now the Son of Man has been glorified, and God has been glorified in him. 32If God has been glorified in him, God will also glorify him in himself and will glorify him at once. I actually feel sorry for Judas. I mean, don’t you think the world is a little too quick to jump on him and portray him as the son of darkness. And we are ready to follow along and release the other disciples from any wrongdoing. (After all…it was apparent, they really didn’t get what was going on anyway!) I really do think that Judas loved Jesus. Think about this as a possibility: Soldiers come to Judas in the dark of night. This had to be scary. After all, the tension of the week is mounting. “Show us Jesus; show us your Lord.” Judas hesitates. “Why are you afraid? Because if Jesus really IS Lord, he can prove it…he can get out of it…just show us. And here…here’s some money for your trouble.” You know, thinks Judas, they’re right. He is Lord. He can get out of it. And then, as the writer of Matthew’s Gospel account depicts, when Jesus was condemned to death, Judas could not face himself. What had he done? How could he live with it? How could he ever be forgiven? And so he hanged himself, a victim of his own choices and his own action. And as for the blameless others, think about Simon Peter, so eager to be a part of Jesus’ “inner circle”…but, three times he was asked…and three times he denied even knowing Jesus. Is it that much worse to betray a trust then to deny that trust altogether? We assume not, because we are much more likely to be the culprits of this denial, going our own way, following the ways of the world. But surely, that can’t be as bad! So Judas remains the fall guy, the poster child for the worst sin imaginable, and the focus of all the blame for crucifying the Savior of the world. Do we really think that it was ALL Judas’ fault? Was it Judas’ kiss that started the cycle that would end on the Cross? I don’t think we’re that naïve. All of the disciples played a part. All of society played apart. All of us play a part. We are all betrayers; we are all deniers; we are all beloved children of God. So, is this story supposed to be about betrayal or about forgiveness? None of us are innocent. All of us are forgiven. Holy Thursday does not end in betrayal; it ends in love. Perhaps rather than trying to lay blame for what happened at the Cross, perhaps rather than using Judas as the scapegoat for all of our own sins, we should let the Cross be what it is—a place of healing, a place of reconciliation, a place of forgiveness, a place of life recreated. Because of the Cross, all of us are invited to the table—even the Judases among us. FOR TODAY: In the Name of Christ, you are forgiven—all of you. Imagine yourself forgiven. 20Now among those who went up to worship at the festival were some Greeks. 21They came to Philip, who was from Bethsaida in Galilee, and said to him, “Sir, we wish to see Jesus.” 22Philip went and told Andrew; then Andrew and Philip went and told Jesus. 23Jesus answered them, “The hour has come for the Son of Man to be glorified. 24Very truly, I tell you, unless a grain of wheat falls into the earth and dies, it remains just a single grain; but if it dies, it bears much fruit. 25Those who love their life lose it, and those who hate their life in this world will keep it for eternal life. 26Whoever serves me must follow me, and where I am, there will my servant be also. Whoever serves me, the Father will honor. 27“Now my soul is troubled. And what should I say—‘Father, save me from this hour’? No, it is for this reason that I have come to this hour. 28Father, glorify your name.” Then a voice came from heaven, “I have glorified it, and I will glorify it again.” 29The crowd standing there heard it and said that it was thunder. Others said, “An angel has spoken to him.” 30Jesus answered, “This voice has come for your sake, not for mine. 31Now is the judgment of this world; now the ruler of this world will be driven out. 32And I, when I am lifted up from the earth, will draw all people to myself.” 33He said this to indicate the kind of death he was to die. 34The crowd answered him, “We have heard from the law that the Messiah remains forever. How can you say that the Son of Man must be lifted up? Who is this Son of Man?” 35Jesus said to them, “The light is with you for a little longer. Walk while you have the light, so that the darkness may not overtake you. If you walk in the darkness, you do not know where you are going. 36While you have the light, believe in the light, so that you may become children of light.” After Jesus had said this, he departed and hid from them. We had this passage week before last, but it also appears as the Holy Tuesday lectionary reading. We know about the wheat, how the seed must die so that the fruit can be, how, essentially, the seed must surrender itself, allow itself to die so that it can become something else. It’s hard for us to grasp. Those of us who live in Western society are much more accustomed to being told what to believe, for our beliefs to grow as they are added on to each other until we are so full of a collection of beliefs that we are about to explode. The idea of surrendering, of letting a part of oneself literally fall away is foreign to us. This morning (because I’m late in posting this), the Today Show interviewed three faith leaders as part of their week-long series on faith and spirituality. The question for this morning is “Who is God?” That’s a pretty big question. It’s essentially the same question with which those in this Gospel account are struggling. Who is God? See, they said, we’ve learned from the law that the Messiah remains forever. We got that. So what is this about being lifted up? And who this Son of Man character that you keep talking about? But we are no different. We would be much more comfortable if God just laid it all out for us, made it all a bit more obvious, maybe just made that light into which we are supposed to walk so incredibly overwhelming that none of us could miss it. What we’re saying is that we would be much more comfortable if we COULD faithfully answer the question “Who is God?” and know that we are actually getting it right. But then we are told that we have to die, give up the self that we have tried so desperately to hone and perfect. Essentially, if we let our ideas and notions about who God is die away, we will know who God is. Now that just seems ridiculous, doesn’t it? I don’t think we come to know God by learning about God. We come to know God as we discover who God is in our lives, as we walk through the wilderness where God is revealed to us without the shadows of our lives and our preconceived notions getting in the way, as we walk through the darkness and finally see the light for ourselves rather than it being something that blinds us to itself. Jesus never really gave a straight answer to this question. (ACTUALLY, I don’t really think Jesus ever gave a straight answer to many questions.) We are instead compelled to follow, to leave ourselves behind, and to come and see for ourselves. Our faith journey, our coming closer and closer to God, our own way that God is revealed in our lives comes about through discovery rather than memorization, through doubt rather than certainty, through darkness rather than blinding light. So as we walk through this Holy Week, let us leave ourselves behind and discover our Lord anew, discover the God who will raise us up if we are not so tied down. FOR TODAY: Close your eyes and let yourself slip away. Open them and look for the light that you were missing. You can imagine these friends around this table filled with the scents of wonderful food, telling stories and laughing together. They knew that the environment was difficult in the city. They knew that outside the warmth of this home were whispers of what was to come. But, for now, it felt better to just be together and not talk about what was brewing outside. And then Mary gets up and picks up this beautiful jar of expensive perfume. She pours it lavishly on Jesus’ feet not caring to conserve it at all. The smell of the perfume fills the room. And Mary kneels all the way down and loosens her hair, letting it fall to the floor. She then uses her hair to wipe the oil from Jesus’ feet. In the silence created by the others in the room, Mary expressed her deep love for Jesus. She knew who Jesus was and she knew that the hour of his death was fast approaching. So, Mary put herself on the line, violating all of those societal rules that were in place. First, women weren’t supposed to put themselves in a position of being the center of attention. They were not supposed to touch a man that was not their husband, And the hair…for a woman to put her hair down in public would have been a disgrace. And then she wastes all that costly perfume. But you see, Mary was truly overcome with love for Christ. And she wanted him to know that she got it. The act was part of her. It was sacramental, an expression of who she was and what Christ’s love had made her. Think about some of the language of the story—Mary took, poured, wiped. We will hear those same words this Thursday in the account of Jesus’ last meal: Jesus took the bread, poured out the wine, and wiped the feet of the disciples, and through these common gestures and such common touch, Jesus shows us what true love is. And as Mary takes, and pours, and wipes, she shows that same love toward Christ, and this small crowded house in Bethany becomes a cathedral and this simple meal becomes a Eucharist. Through her touch, through her love, the ordinary becomes sacred. Mary enters Jesus’ life and he becomes part of her. Her life becomes a sacrament that shows Jesus’ love to the world. And the whole world is now forever filled with the fragrance of that perfume. This was Mary’s calling. It was the way she loved, filling the house with the scent of grace and gratitude, filling the house with all she had, all that Jesus had made her be. In this holiest of weeks, what would it mean for you to love Jesus that much? What would it mean for you to love anyone that much, so much that you would defy who the world thought you should be, so much that you would risk your reputation, your relationships, perhaps your life? What would it mean for you to pour yourself out for Jesus? FOR TODAY: Take, pour, wipe. Give lavishly and extravagantly. Be the poem. When they were approaching Jerusalem, at Bethphage and Bethany, near the Mount of Olives, he sent two of his disciples 2and said to them, “Go into the village ahead of you, and immediately as you enter it, you will find tied there a colt that has never been ridden; untie it and bring it. 3If anyone says to you, ‘Why are you doing this?’ just say this, ‘The Lord needs it and will send it back here immediately.’” 4They went away and found a colt tied near a door, outside in the street. As they were untying it, 5some of the bystanders said to them, “What are you doing, untying the colt?” 6They told them what Jesus had said; and they allowed them to take it. 7Then they brought the colt to Jesus and threw their cloaks on it; and he sat on it. 8Many people spread their cloaks on the road, and others spread leafy branches that they had cut in the fields. 9Then those who went ahead and those who followed were shouting, “Hosanna! Blessed is the one who comes in the name of the Lord! 10Blessed is the coming kingdom of our ancestor David! 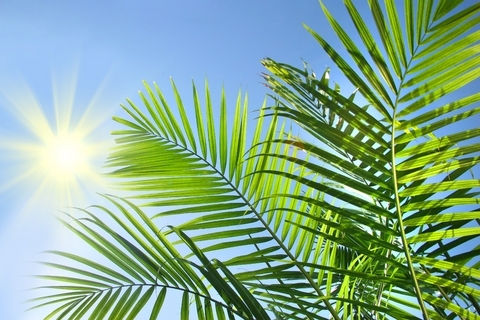 Hosanna in the highest heaven!” 11Then he entered Jerusalem and went into the temple; and when he had looked around at everything, as it was already late, he went out to Bethany with the twelve. Here we are—bustling city, Passover festival, and a parade! It seems that we’re not in the wilderness anymore! As Jesus comes into Jerusalem, there is excitement and joy. He is here! And they honor him. But, to be honest, we probably read a little bit more into this parade than is there. From the time I was little, I had this sense that Jesus came into the middle of the city, flanked by the all of the crowds. He was “it.” (But then it didn’t make much sense as to why it went so badly so fast.) The truth is, Jesus was not “it” in Jerusalem. Jesus was heading what was then a small fledgling movement on the outskirts of established religion. He was coming down a narrow road that winds down Mt. Olivet and was then entering through the eastern gate of Jerusalem, the “back door” of the city, for all practical purposes. Hmmm! It seems that Jesus makes a habit of coming in the back door—into forgotten grottos and wilderness baptisms and ministries that begin around a lake rather than a Holy City. So this seems only fitting. Maybe that’s the point. God doesn’t always enter in the way we expect, doesn’t always show up when it fits the best into our schedule. Instead, God slips in through the back door of our wilderness lives when we sometimes barely notice and makes a home with us. So the onlookers stay around for just a little while. And then the parade fizzles. 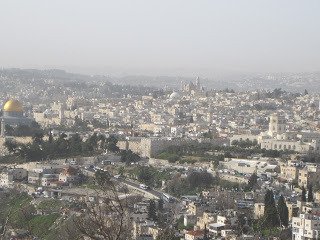 As the road goes by the Garden of Gethsemane and down toward Bethany and the outer walls of Jerusalem, many leave and go back to their lives. Maybe they had something to do; maybe they didn’t want to contend with all the holiday traffic in downtown Jerusalem; or maybe they were afraid of what might happen. So Jesus enters the gate of the city almost alone, save for a few of the disciples. Where are we in this moment? Jerusalem is here. The wilderness through which we’ve traveled is behind us. But it has prepared us for a new wilderness of sorts. As followers, we know that the road is not easy. It will wind through this week with the shouts of “Crucify him” becoming louder and louder. The road is steep and uneven. And the shouting stones and clanging iron against wood will be deafening. But this is the way—the way to peace, the way to knowing God. This is our road; this is our Way; this is the procession to life. The way to the Cross, through the wilderness of this week is our Way to Life. FOR TODAY: Keep walking. Keep following. There is no way around. Walk with Jesus all the way to the Cross. For there, you will find life. 2Six days later, Jesus took with him Peter and James and John, and led them up a high mountain apart, by themselves. And he was transfigured before them, 3and his clothes became dazzling white, such as no one on earth could bleach them. 4And there appeared to them Elijah with Moses, who were talking with Jesus. 5Then Peter said to Jesus, “Rabbi, it is good for us to be here; let us make three dwellings, one for you, one for Moses, and one for Elijah.” 6He did not know what to say, for they were terrified. 7Then a cloud overshadowed them, and from the cloud there came a voice, “This is my Son, the Beloved; listen to him!” 8Suddenly when they looked around, they saw no one with them any more, but only Jesus. 9As they were coming down the mountain, he ordered them to tell no one about what they had seen, until after the Son of Man had risen from the dead. 10So they kept the matter to themselves, questioning what this rising from the dead could mean. The wilderness has taught us to see things differently, to open our minds and widen our souls. It has called us to remove the veil that we have created in our lives to shield us from the things that do not make sense in our world. The journey through the wilderness has brought us to this place, brought us to this mountain. Don’t you think the disciples were sort of wondering where they were going? After all, they had left everything they had, had given up everything and sacrificed all of those things that made life secure and safe. They did it all to follow Jesus and now they are climbing up this mountain to a place that they did not know. 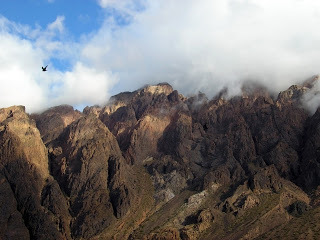 The mountain that Jesus and the disciples climb sounds a lot like Mount Sinai rising out of the wilderness that Moses had ascended centuries before. And there on the mountain, they see Jesus change, his clothes taking on a hue of dazzling, blinding white, whiter than anything they had ever seen before. And on the mountain appear Moses and Elijah, standing there with Jesus—the law, the prophets, all of those things that came before, no longer separate, but suddenly swept into everything that Christ is, swept into the whole presence of God right there on that mountain. And then the voice…”This is my Son, my Chosen: listen to him!” OK…what would you have done? First the mountain, then the cloud, then these spirits from the past, and now this voice…”We are going to die. We are surely going to die,” they must have thought. And then, just as suddenly as they appeared, Moses and Elijah drop out of sight and Jesus was standing there alone, completely unveiled. And all that was and all that is has become part of that, swept into this Holy Presence of God. And, more importantly, we are invited into it. No longer are we shielded from God’s Presence. We become part of it, a mirror for all to experience and encounter the living God. And so the disciples start down the mountain. Jesus remains with them but they kept silent. The truth was that Jesus knew that this account would only make sense in light of what was to come. The disciples would know when to tell the story. They saw more than Jesus on the mountain. They also saw who and what he was. And long after Jesus is gone from this earth, they will continue to tell this strange story of what they saw. For now, he would just walk with them. God’s presence remains. The Hebrews understood that no one could see God and live. You know, I think they were right. No one can see God and remain unchanged. We die to ourselves and emerge in the cloud, unveiled before this God that so desires us to know the sacred and the holy that has always been before us. The truth is, when we are really honest with ourselves, we probably are a little like the disciples. We’d rather not really have “all” of God. We’d rather control the way God enters and affects our lives. We’d rather be a little more in control of any metamorphosis that happens in our lives. We’d rather be able to pick and choose the way that our lives change. We’d rather God’s Presence come blowing in at just the right moment as a cool, gentle, springtime breeze. In fact, we’re downright uncomfortable with this devouring fire, bright lights, almost tornado-like God that really is God. Here in the wilderness, with bright white lights and shrouds of wonder, we have seen God. Here, in this place, where the wilderness has brought us. We have arrived open-eyed and soul-ready for God’s Presence to be made known. And this was nothing like anything that we would have imagined—Old Testament heroes re-appearing, God speaking from the cloud, and Jesus all lit up so brightly that it is hard for us to look at him. And then the lights dim. There are no chariots, Moses and Elijah are gone, and, if only for a little while, God stops talking. And in the silence, Jesus starts walking down the mountain toward Jerusalem. You know, on some level, for all the dramatic sequences of this story, I think the way down the mountain is the point of it all. I mean, think about it, the disciples went up as students, as mentees, as admirers, and came down as followers. The way down is where the transformation begins to be, when they know where they had to go. Now I’m sure that Jesus knew that the ones who walked with him were not ready. I’m sure he knew that they thought they had more time with him. I’m sure he knew that they doubted themselves. But it was time. And Jesus knew that if they followed, they would know the way. And in this moment, Jesus’ journey to the Cross begins and the disciples, for all the antics that they will pull over the next few days, begin the same journey. And us? I’m sure Jesus knows how difficult this has been for us. I’m sure Jesus knows that there is a part of us that would’ve liked to have avoided the whole thing, to move from the Mardi Gras party right into the sanctuary when they are setting up the Easter lilies. But then we would have missed the wilderness and we wouldn’t know where to go. We know now what we must do, where we must go. We know that we are called to follow Jesus. The way down is hard. Jerusalem is going to be even harder. But the wilderness has taught us that it is where we must go. You see, in this wilderness, we have changed. We have learned to let go, to get out of ourselves, to see things differently. We have learned to listen. We have learned to follow. And that is what we will do. Jerusalem awaits. FOR TODAY: The gates of the city are just up ahead. There is no other way around. This is not an easy journey. But it one that all of must walk. As you enter this Holiest of Weeks, what do you need to leave behind? And what do you need to carry into the city? Now it was the day of Preparation for the Passover; and it was about noon. He said to the Jews, ‘Here is your King!’ They cried out, ‘Away with him! Away with him! Crucify him!’ Pilate asked them, ‘Shall I crucify your King?’ The chief priests answered, ‘We have no king but the emperor.’ Then he handed him over to them to be crucified. So they took Jesus; and carrying the cross by himself, he went out to what is called The Place of the Skull, which in Hebrew* is called Golgotha. There they crucified him, and with him two others, one on either side, with Jesus between them. Pilate also had an inscription written and put on the cross. It read, ‘Jesus of Nazareth,* the King of the Jews.’ Many of the Jews read this inscription, because the place where Jesus was crucified was near the city; and it was written in Hebrew,* in Latin, and in Greek. Then the chief priests of the Jews said to Pilate, ‘Do not write, “The King of the Jews”, but, “This man said, I am King of the Jews.”’ Pilate answered, ‘What I have written I have written.’ When the soldiers had crucified Jesus, they took his clothes and divided them into four parts, one for each soldier. They also took his tunic; now the tunic was seamless, woven in one piece from the top. So they said to one another, ‘Let us not tear it, but cast lots for it to see who will get it.’ This was to fulfil what the scripture says, ‘They divided my clothes among themselves, and for my clothing they cast lots.’ And that is what the soldiers did. Meanwhile, standing near the cross of Jesus were his mother, and his mother’s sister, Mary the wife of Clopas, and Mary Magdalene. When Jesus saw his mother and the disciple whom he loved standing beside her, he said to his mother, ‘Woman, here is your son.’ Then he said to the disciple, ‘Here is your mother.’ And from that hour the disciple took her into his own home. After this, when Jesus knew that all was now finished, he said (in order to fulfil the scripture), ‘I am thirsty.’ A jar full of sour wine was standing there. So they put a sponge full of the wine on a branch of hyssop and held it to his mouth. 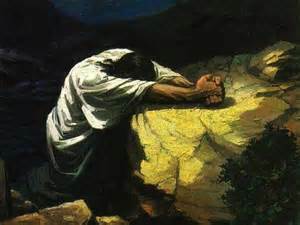 When Jesus had received the wine, he said, ‘It is finished.’ Then he bowed his head and gave up his spirit. It is finished–all the announcing, all the birthing, that star over the manger, the shepherds, the wisemen, the ministry around the lake, the welcoming, the pushing, the encouraging, the healing, the teaching, the last meal–it is finished. What would we do for just one more moment, one more moment to kneel at the feet of the Savior and worship and love and learn and bask in a Presence that we can’t even explain? What would we change about how we had done it, how much we paid attention, how much we were aware? What would we tell Jesus that we did not? What would we do rather than betray him, betray his trust, his love, his faith in who we are and what we can do? This is the most difficult for us Protestant Christians, those of us who have chosen to spend the whole of our church year bowing before the “empty Cross”, the depiction of Christ’s Resurrection and the promise of our own salvation. And while I’m not willing to trade the large gleaming empty cross at the front of my own sanctuary and permanently replace it with a Crucifix, I think that we do miss part of what the Cross means if we choose to never enter the pain and the suffering that is Christ’s. In fact, Howard asks, “Where, suddenly, is the theology that teaches that because the Savior did it all, we thereby are reduced to the status of inert bystanders?” Because, truthfully, when the chips were done, the people stood by. WE stood by. We stand by and we let Christ suffer, wait for Christ to finish up this whole messy ordeal, hand us a lily and a pretty bonnet, and invite us to joyfully sing “Christ the Lord is Risen Today” and go on about our business. The season of Lent, though, is about entering the experience of the Cross—the whole experience. Because how can one understand the joy of Resurrection without experiencing the pain and suffering and even the death of Crucifixion? The two cannot be separated. We are called to enter and bear all that is Christ—the pain, the suffering, the death, and, just when we think “it is finished”, the joy of rising to eternal life, to an eternity of oneness with God. If we are to truly understand what that means, we must, then, embrace the entirety of the message of the Cross. And so, perhaps, if only for awhile (maybe 40 days or so! ), we should spend this Season of Lent truly looking at the “pre-Easter” experience of the Cross. 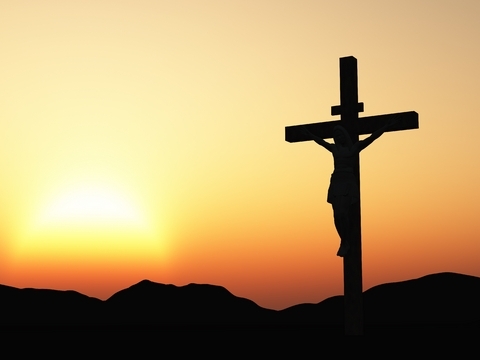 You will be amazed what that Easter morning Cross, gleaming in the sunlight of a newly created day, looks like if you understand how God created it, if you have experienced all that is God. So, in this moment, in this moment when it is all finished, the moment that, for now, our journey ends, what do we do? What is next? You know, this thing would have been a whole lot easier to piece together and market if Jesus had died a hero. But Jesus did not come as a hero; Jesus came as a servant, a humble human servant, to show us what life means. So, were you there? Sometime I wonder if I was. Sometimes I’m too busy or too tired or too convinced that I already have it figured out. Sometimes I forget to be there. I have taken this whole journey wanting so badly to be near Jesus, wanting so badly to be connected, to be one. But sometimes I forget to be there. Sometimes I want to jump ahead and set up for the Easter celebration. But today, in this moment, we are called to be there, to stand, perhaps alone, and be with Jesus on the Cross, to be there when it is finished. Hard as it may be, we have to live the end, to live the “it is finished” before we can live the beginning. So sit here at the Cross, in this moment, this finished moment. After the Crucifixion, this defeated little band of disciples had no hope. As you can imagine, they had no expectation of anything else to come. Everything in which they believed, in which they had invested their lives, had died on the cross. It seemed to them that the world had been right and they had been wrong. Joan Chittister says that “the road behind us becomes what frees us for the road ahead.” In this moment, God was already freeing them from grief and recreating joy. And us…there is something in all of us that struggles with the thought of God suffering. We instead imagine a God that stands apart from us, shielded from pain, and prepared to pick up the pieces of our lives when we need it. But God, in God’s infinite wisdom rather recreates our lives from the inside, from the point of our deepest pain and suffering, from the cross, and even we become new Creations whether or not we can see it now. The cross is the rebirth of humanity in all its fullness. In this moment, it is death that dies. Truthfully, it is DEATH that is finished. It is hard for us to see right now. It is hard to see clearly through the tears of grief. Christ died on a cross in immense suffering and pain. And those who love him grieve a grief such that they have never known. And just when nothing else makes sense, it is in that moment that your eternity has begun. There is Light ahead but for now, just for a moment, we sit here at the Cross. It is finished. This is the moment. This is the moment that you begin. Jesus did not die a hero to emulate; he died to give us Life. No longer a bystander, we are called to enter that Life. What does that mean? Go forward…you can’t see it just yet but your eternity has begun!